Today Moo, my friend M, and her daughter, and I went geocaching in Akron, after having lunch at Whitehouse (Chicken... Yum!) We knew that Moo and I could find our 500th cache today. I wanted to pick a fun cache to find. It worked out well. We found one close to Derby Downs, where the Soapbox Derby is held. It was inside a sports bottle that was tucked inside a tree. Moo traded a finger light for a pin. So much fun! I was just talking to someone the other day about Moo's love for those "As Seen on TV" commercials that advertise products. She watches them and then comes to tell me we should get the product advertised. 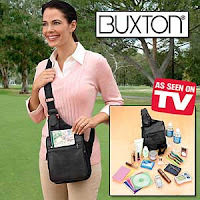 Today it was "The Buxton Bag." "Mom! Come here fast! You need this! Come here! Come here! It's a bag that organizes all your things. It has a pocket for your cell phone. You won't miss any phone calls. You should get it!" I chuckled even more when she ended with, "Gee, that was a mouthful!" I awoke this morning ready to sing the praises of my Savior. I'm not a great singer, but I know my voice of praise was pleasing to Him. The songs that rose from my lips were the old hymns that I sang growing up. Even worse than my singing voice is my memory for lyrics. I was then compelled to look up some of they hymns so I could actually sing them. Contained within these lyrics is the REAL meaning of LIFE! Here are a couple songs we sang from the service this morning. I love these lyrics as well. They are a lot newer than the hymns listed above. Happy Easter! Christ Jesus is risen today! My friend just sent me this. I read it before and loved it. Now I'm passing it on. On the first day, God created the dog and said: 'Sit all day by the door of your house and bark at anyone who comes in or walks past. For this, I will give you a life span of twenty years.' The dog said: 'That's a long time to be barking. How about only ten years and I'll give you back the other ten?' So God agreed. On the second day, God created the monkey and said: 'Entertain people, do tricks, and make them laugh. For this, I'll give you a twenty-year life span.' The monkey said: 'Monkey tricks for twenty years? That's a pretty long time to perform. How about I give you back ten like the Dog did?' And God agreed . On the third day, God created the cow and said: 'You must go into the field with the farmer all day long and suffer under the sun, have calves and give milk to support the farmer 's family. For this, I will give you a life span of sixty years.' The cow said: 'That's kind of a tough life you want me to live for sixty years. How about twenty and I'll give back the other forty?' And God agreed again. So that is why for our first twenty years we eat, sleep, play and enjoy ourselves. For the next forty years we slave in the sun to support our family. For the next ten years we do monkey tricks to entertain the grandchildren. And for the last ten years we sit on the front porch and bark at everyone. Life has now been explained to you. Today was rainy. Really rainy. I took Moo to my mom's and dad's before school, as I usually do. This is where we decided to bury Oswald. A couple of thoughts came to her mind, concerning all the rain and our deceased feline. "I hope Oswald stays warm today. I know he will get muddy." These comments just make me think and wonder how these thoughts came to be in her mind. How does she understand death and burial? I refrained from explaining anything this time. I figure I'll let her formulate her own ideas for the time being, especially since she was so matter-of-fact when she said these things. One of the hardest decisions of my adulthood, to this point, was made this weekend. Our cat, Oswald, stopped eating a couple weeks ago. He got progressively worse. Last Monday I had him into the vet. The visit cost almost $200. It included the office visit, fluids, and a blood test. The blood test came back okay. That meant choosing whether or not we would do further testing. Each day we tried to get him to eat or show some sign of recovery. Nothing. After debating between the testing and euthanizing him, we chose to put him to sleep. I was on my own, since my hubby already had plans on Saturday and I didn't expect Moo to be there, although I gave her the option. I'm glad she didn't want to be there. She was with me when I buried him though. It was a hard decision, but after I made the decision the one girl in the office told me that she always promised herself that she when her cats get so sick, that she will just let them go. That way, she saves her resources to rescue other animals that need her help. For pets, she believes that quality of life is more important that quantity. She made me feel so much better about our decision. She was absolutely wonderful. They made clay paw prints for us. We had Oswald for almost ten years. We got him shortly after moving into our house. We named him on the way home from the farm where we picked him up. He was named after the character, Oswald, on The Drew Carey Show. Oswald was the very first living creature that J and I were in charge of on our own. The wall in our kitchen still shows that it was a temporary scratching post for him at one time. It is strange to not have him around. I believe Moe, our dog, was even looking for him when we mentioned Oz's name today. We will miss his meow, his silent attacks on our feet, and his massive presence at the foot of our bed. Oswald was a great pet.